Sometimes all you want is something comfortable and warm to wear- and it has to look great too of course. I had debated about making a Tilly and the buttons Coco but somehow the pattern just isn’t me. 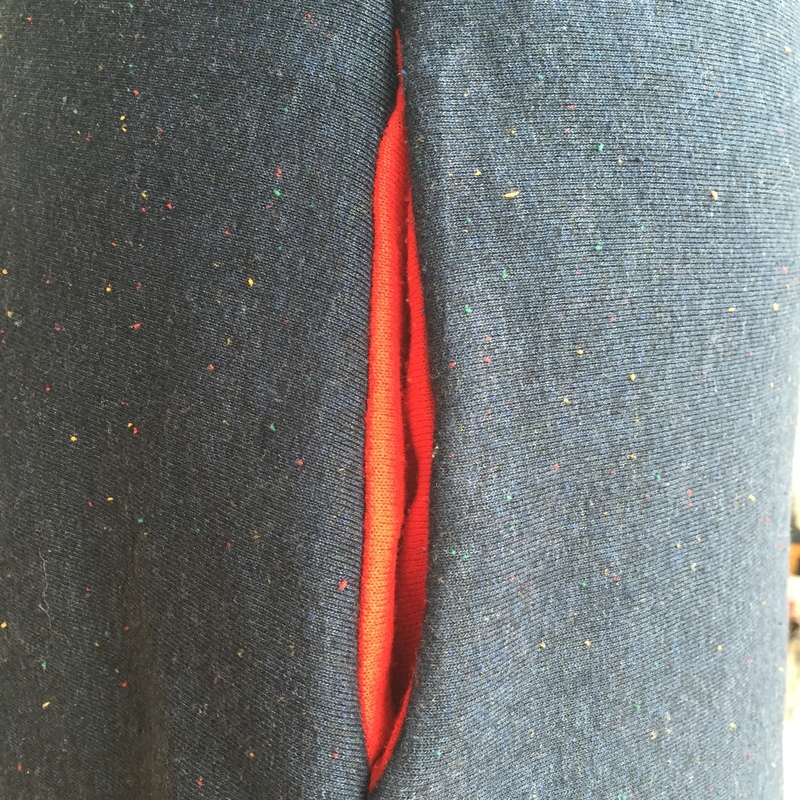 I think it might be the a-line shape of the skirt. 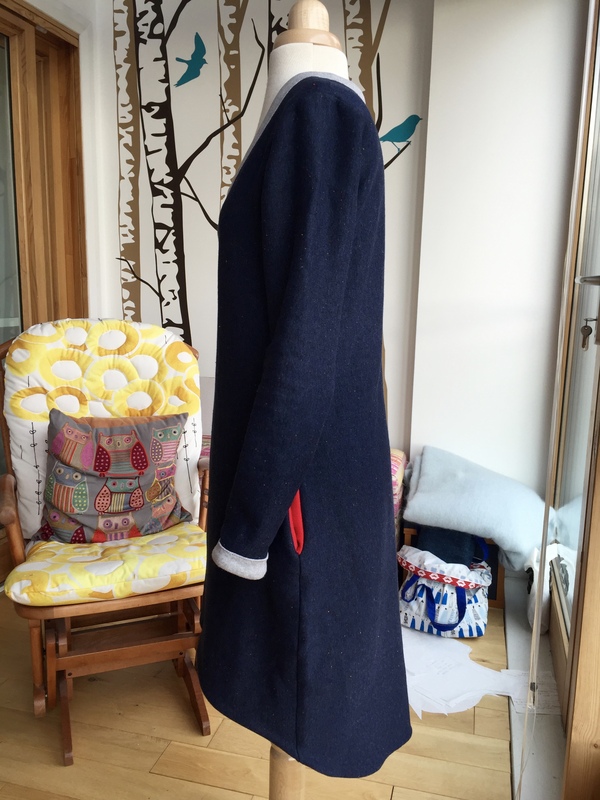 I have made one, it took me over a year to finish and, so far, it has hung in my wardrobe unworn although I have taken it out and tried it on a few times. 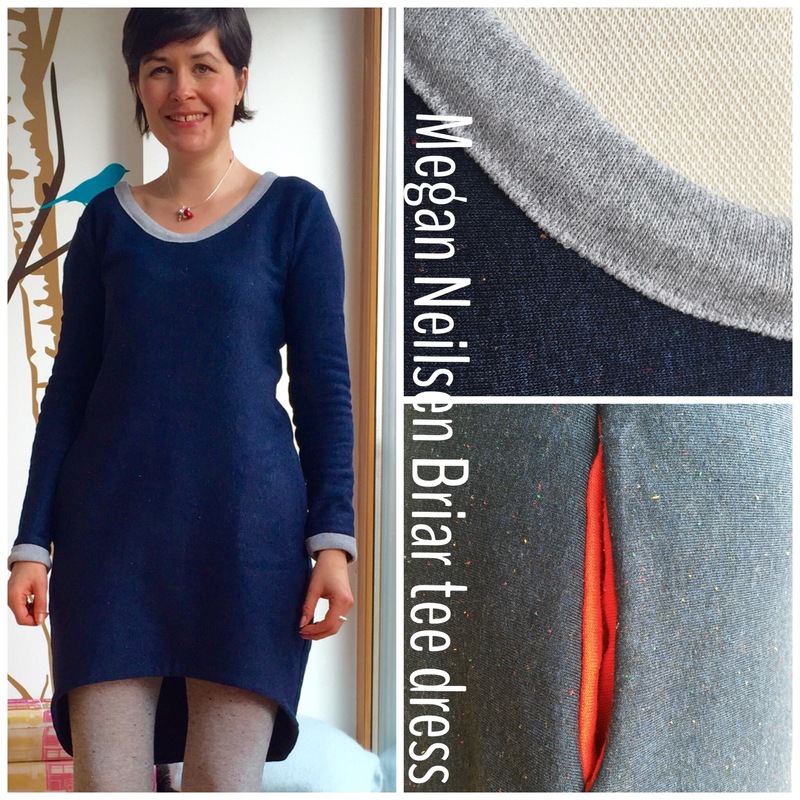 I do, however, love the dropped hem of the Megan Neilsen pattern the Briar tee and whilst doing some inspiration-seeking internet browsing came across her tutorial for turning it into a dress- bingo! That was exactly what I was looking for. 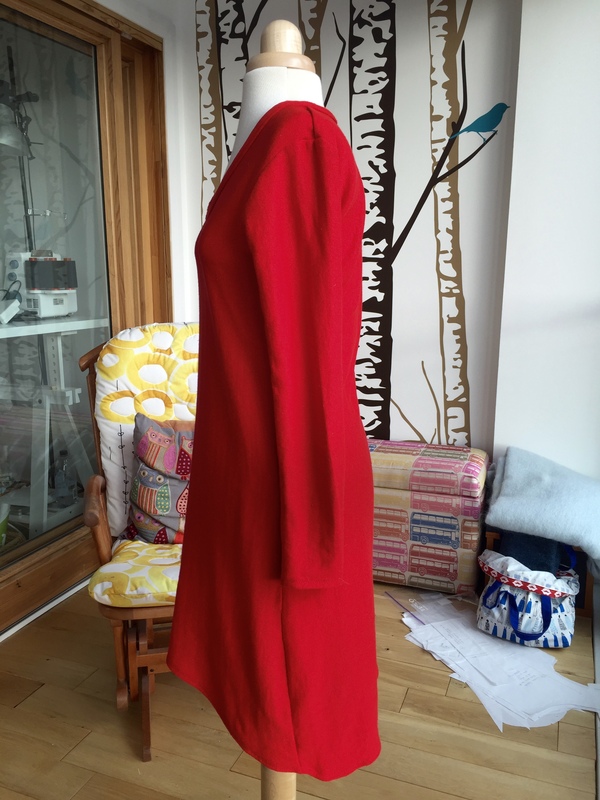 I started with a wearable toile just to be on the safe side. I found a couple of metres of bright red sweatshirting in Mandors to have a play with. 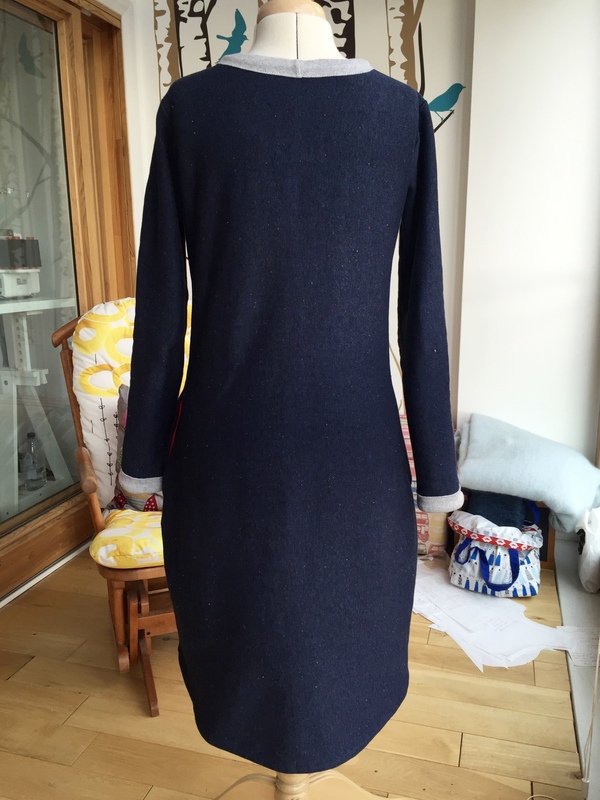 The pattern work was really straight forward, just a slash and spread adding 9″ to the length at the widest part of the front and back pieces then tidying up the outer edges with the French curve. 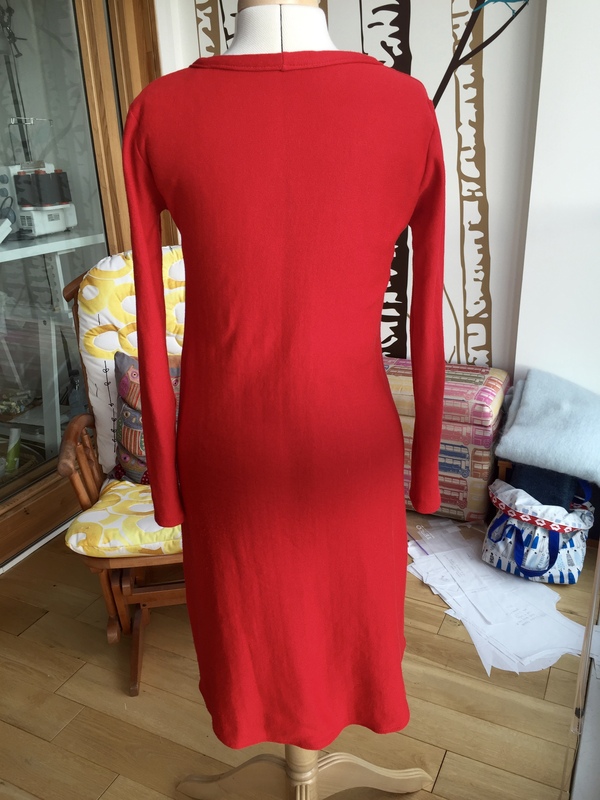 The toile went together on the overlocker in no time and I used the neck binding rather than the neckband because I like the clean finish on the inside. The whole thing was done and ready to wear in about an hour and a half. 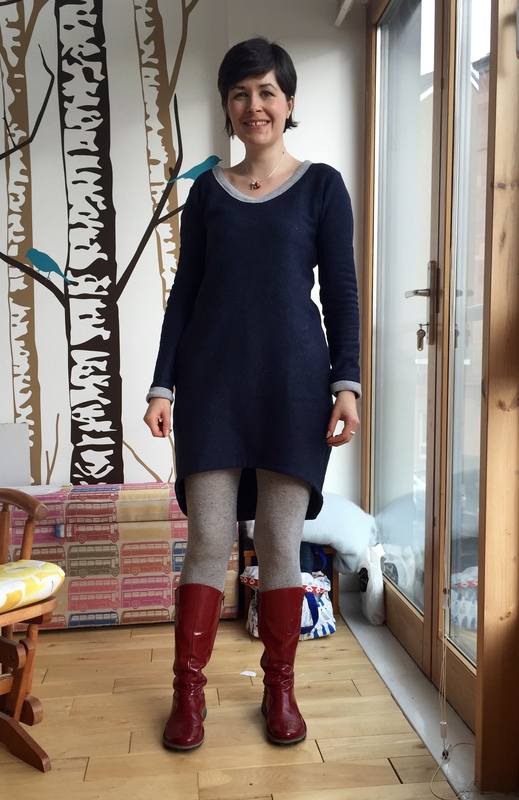 I really like it- the fit is good and I’ve worn it quite a bit. I just wish I had added pockets to it. 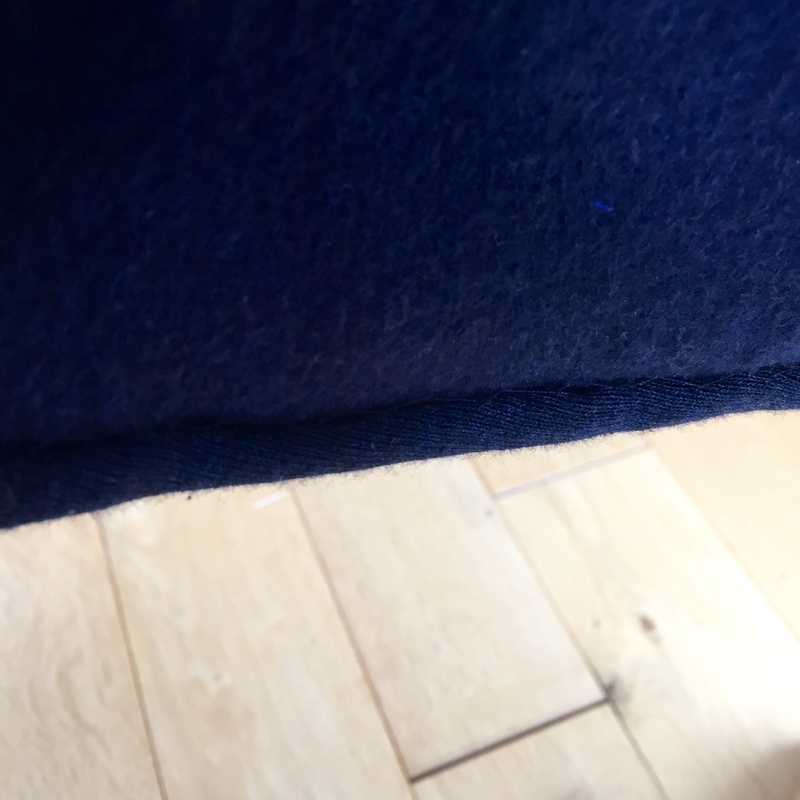 …and about half an inch to the length at the front graded out to the side seams. 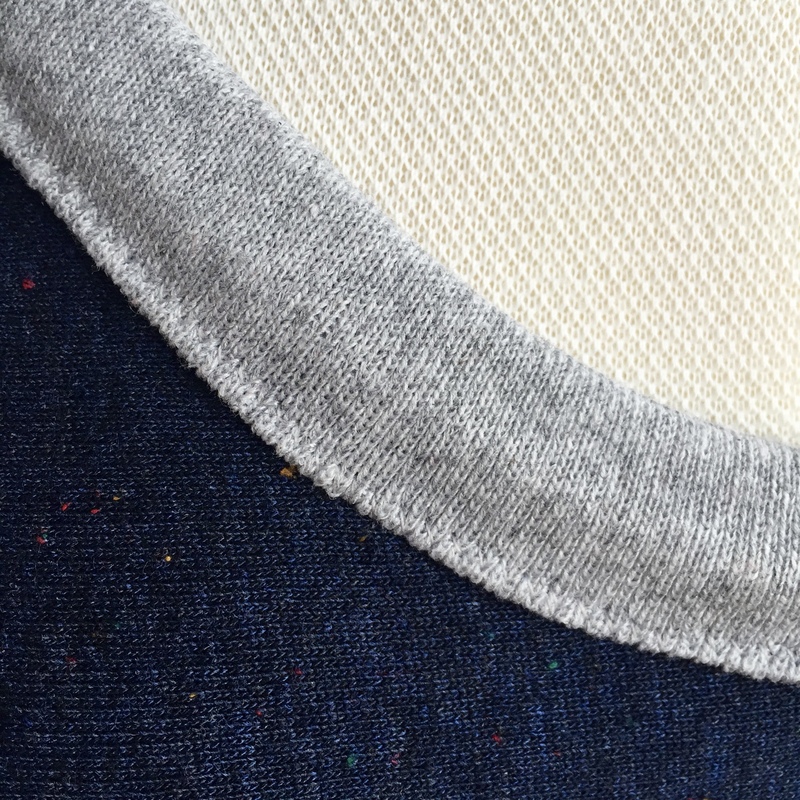 The neck binding is made in a very fine, stretchy grey ribbing also from The Cloth House. I also used it to bind the cuffs. 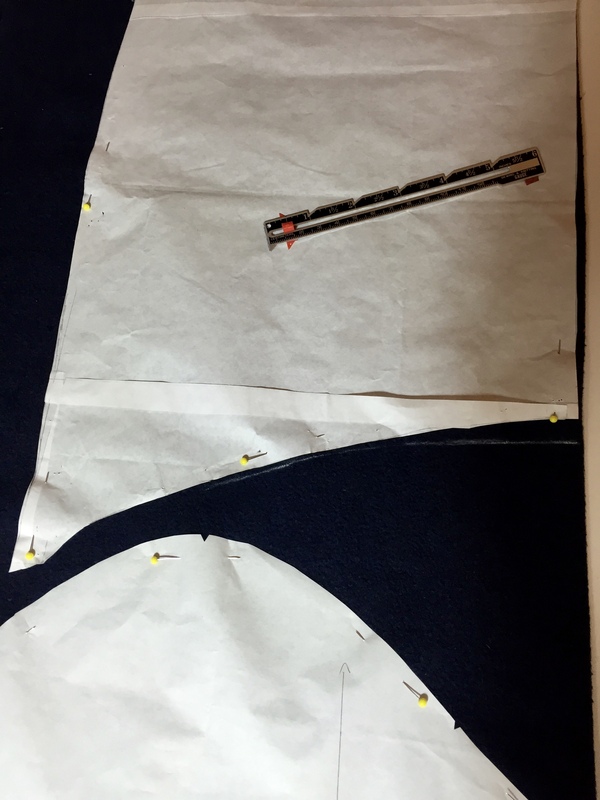 I measured the finished circumference of the cuff (minus seam allowance) and cut a pattern piece the same width as the neck binding piece and 10% shorter than the cuff circumference. 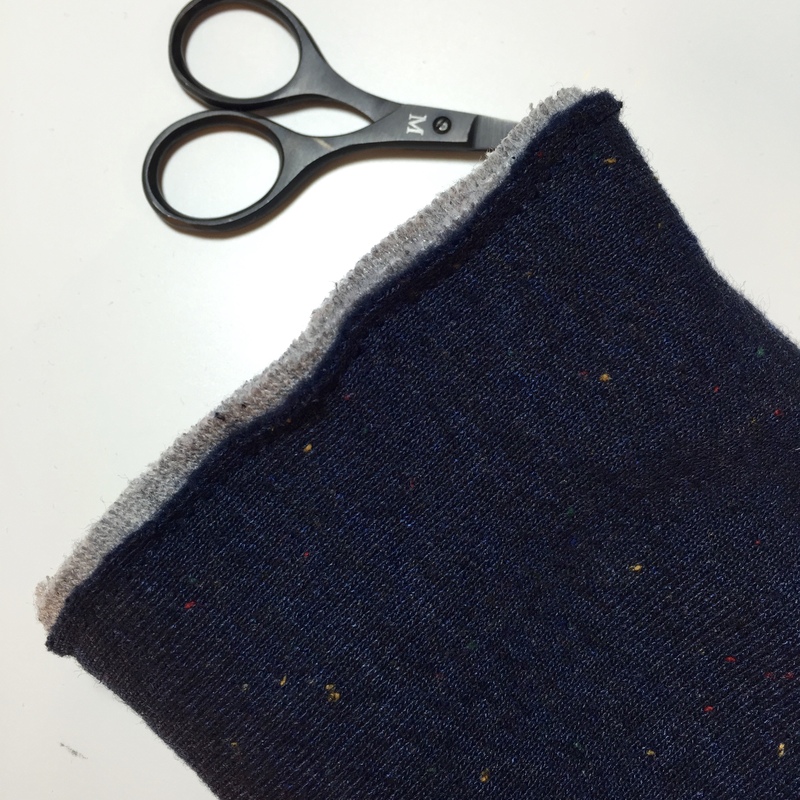 I did trim the seam allowance by about half to reduce the bulk because the fabric was very heavy. 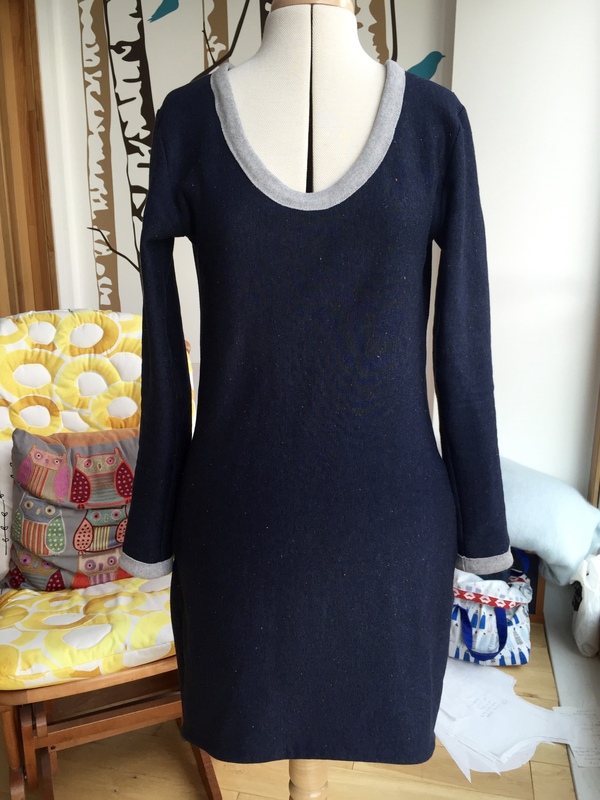 I managed to finish the dress bar the hem before I went on holiday and of course really wanted to wear it whilst I was away. So it was packed into my bag and I used catch stitch to hand finish the hem in the hotel. 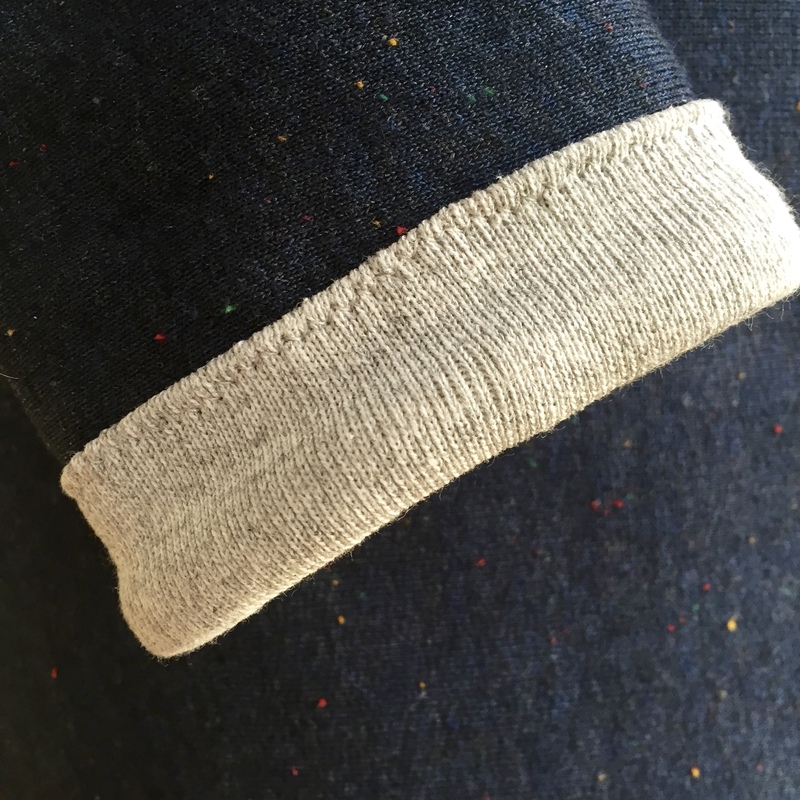 I much prefer a hand sewn hem but this is the first time I’ve done it on a knit. I think the heaviness of the fabric helped and the invisible finish looks really good, particularly with the dropped hem at the back. 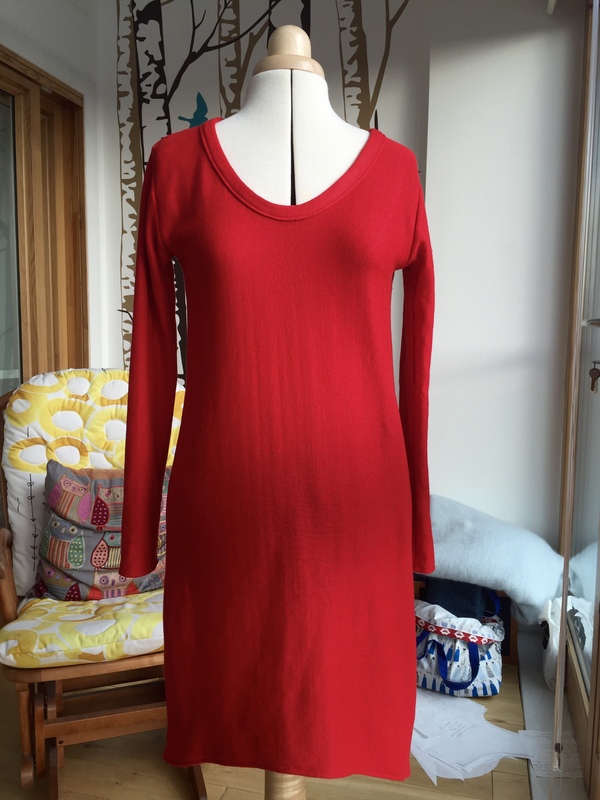 …I LOVE this dress, it’s a great shape and so comfortable that it feels like wearing a very flattering blanket (and it has red pockets :-).